The Walking Dead season 5, episode 6 appears set to feature Carol and Daryl after they hopped in the car to chase the vehicle with the white cross on the back. The timeline this season has multiple episodes happening at once. The events in episode 4–Beth at the hospital–episode 5–Abraham’s splinter group–and episode 6–Daryl and Carol entering downtown Atlanta–all happen at about the same time. 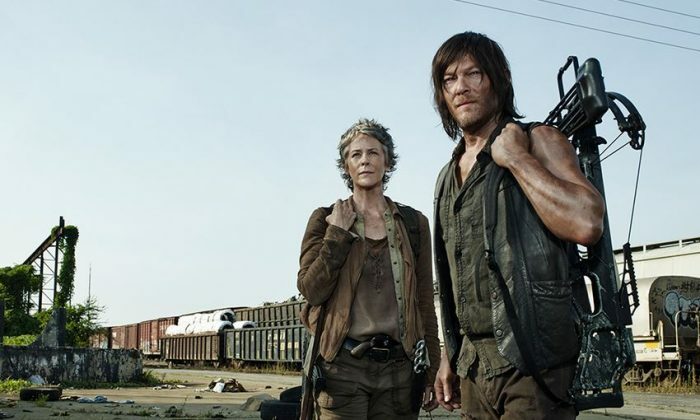 Episode 7 is expected to start after these events, with Daryl bringing Noah to Rick’s group at the church and then subsequently setting off to rescue Beth and Carol from the hospital. Episode 6 is titled “Consumed” and it’s all about Daryl’s burning desire to reunite with Beth and rescue her from whatever peril she’s in. He and Carol follow the white cross vehicle into downtown Atlanta. Photos from filming obtained earlier this year showed Daryl and Carol in Atlanta. The photos indicated that Carol was actually hit at one point by one of the vehicles with the white crosses on them in Atlanta. This could be the point when she and Daryl are separated. “”It’s highly likely that a scene was filmed earlier of Carol being hit by a station wagon with a cross on it. Spectators say that after Carol was hit, two individuals dressed as cops came out of the vehicle. After seeing them, Carol faints and is loaded into the vehicle on a cot,” the fan page said. Scenes shown on Sunday night in a sneak peek of episode 6 showed that Carol and Daryl eventually get out of the vehicle and are going around Atlanta trying to figure out how to break into the hospital. “Stakes are high when members of the group must go on a heroic rescue mission in a previously known location,” according to AMC’s official description. There are several theories going around about what exactly happens in terms of Daryl and Carol separating. One is that Daryl is forced to leave Carol, while another says that the separation is intentional to get Carol into the hospital to try to break Beth out. In either case, most are in agreement based on spoilers that Noah meets up with Daryl somehow and that Noah is the person that Daryl says “come on out” to at the end of episode 3 after approaching the church and being met by Michonne. Episodes 7 and 8 are expected to include Rick’s group planning a rescue mission and then having an intense showdown with the police officers at the hospital when a peaceful resolution can’t be found. But spoilers also indicate that Beth may die in episode 8, or the midseason finale, the second major death of the season after Bob (not including Gareth).